Emirates said the first permitted mobile phone call was made on a flight between Dubai and Casablanca. Emirates plans to extend the system to more aircraft and later this year add BlackBerry and other data services. According to the airline, the mobile service will only be activated when the aircraft is at cruising altitude and the cabin crew will be able to monitor and control the use of the system. Passengers will be able to receive and send text messages, but the crew will be able to prevent voice calls at certain times, such as during night flights. Passengers will also be requested to keep their phones on "silent" mode, said the airline. Emirates said it decided to introduce the use of mobile phones in its fleet after experiencing high demand for the phones already installed in aircraft seats. The airline had to obtain approval from international air safety organisations before adopting the system, which was developed by the AeroMobile company. "We have gone to considerable lengths to ensure that all safety and regulatory issues have been fully addressed", said AeroMobile Chief Executive Bjorn-Taale Sandberg. 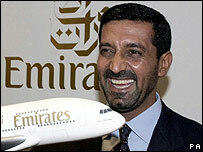 Emirates flies to more than 60 countries and is owned by the government of Dubai.